[I] believe that [I] will be punished for [my] own sins, and not for Adam’s (or Eve's) transgression. Many Christian churches believe that we are being punished in our mortal life as a result of Adam and Eve's choice in the Garden of Eden. When I was young, and investigating many other religions, one thing that drew me quite strongly to the LDS faith was the understanding of individual agency. Rather than denigrating Eve, we venerate her for her bravery. Rather than believing this earth is a punishment for someone else's choices, we take responsibility for our own behavior. We are not ones to claim "the devil made us do it" or to blame Adam for our own misery. I learned from LDS doctrine that woman does not hold the guilt of the world on her shoulders. Rather, informed or not, she made a conscious choice to embrace pain in order to learn joy. She chose to experience the full depth of depression in order to more perfectly see beauty. She chose to learn from her own experience to know good from evil. She explained to Adam, and he chose also to eat of his own will and they became partners in mortality. I found this empowering not only from a female perspective, but from a human one. By our parents' choices, we have been given power to make mistakes, to think, to analyze, and to change. We can exercise our intelligence and choose our own path. We have truly gained the potential to be better, like our Father. As a mother, I have felt this even more empowering. My children have their own lives to live and their own choices to make. So long as I do all I can to love them, teach them, and bring Christ into their lives (and mine! ), I may leave their guilt between them and their Savior. I do not have to live vicariously through them. I am liberated from responsibility for their choices. Watching my beautiful daughter begin to exercise the agency given her in part by Eve's choice, but feeling the precariousness of her mortality, I begin to catch a little of the feeling God must have as He watches me struggle, agonize, and learn. Eve's choice is echoed every time we women face mortality, pain and death to bring life into this world. I would never dull that experience and the ones after it, nor dull the deep connection and love I enjoy with my children as a result. My experiences with this principle have drawn me closer to my first parents. Whether they were apprehensive, frightened, or faithful when they took their first steps into the harsh world, I honor their bravery and the price they paid to give me agency. Rather than severing my connection with them, freedom from their choice has left me able to thank them for it. [I] believe in God, the Eternal Father, and in His Son, Jesus Christ, and in the Holy Ghost. I don't remember the first time I felt God. I remember coming home from Sunbeams class (the first LDS class of religious studies, entered at 5 years old), and telling my parents what I learned at Church that day. "God loves me." My father asked me how I knew that. The answer to my five-year-old mind was clear, "Because my teacher told me so." My dad, always pushing his children to develop their faith further, even when we were so young, said something to the effect of "That's good that you listened to your teacher, but how do you know?" He then told me I should pray to feel it myself. This I did and gained knowledge for myself that God is there and loves me, personally. Many years and experiences later, I had to learn that lesson again. I sat across from my mission president while he asked me the question: "Sister R, do you know that God loves you? Really know it?" Even now, a lump comes to my throat thinking of that moment. At the time, I had forgotten the lesson my father had me learn when I was five. I no longer knew that God loved me, though I still knew He was there. I was fighting my way through my mission, thinking I had something to prove, that somehow I had to earn His love and approbation. It was several days before I could bring myself again to kneel and ask Him to show me how He felt about me. He did. I have never been the same since. These experiences taught me that I had Father in Heaven and who He is as the Father of my spirit. A relationship with Christ, in a way, is and was both easier and more difficult to build. Christ follows our Father in all things. He is the Father of this earth, and the Father of salvation. He, in essence, is the Father of our third life, that life where spirit and body become inseparably connected. He has become so by obeying and following our Heavenly Father in all things. After my experiences with God the Father, knowing I could ask Him all things, I could pray about them and ask for a confirmation of their veracity in my heart. These facts about Christ, and even a conviction of them, have not been enough to develop a personal relationship with Him. For that, I have had to pore over accounts of His dealings with past people in the Bible and other scripture. I have read accounts of His life and teachings. I have had to listen to others' accounts of His dealings. In the end, I have had to live. It is only through life—through experiencing the pain and evil of this life Eve chose for us—that I am coming to know and understand my Savior. In raising a daughter, I have learned what it means to love someone enough to do anything for them, even give life. In learning compassion for and unity with my husband, I have learned what He feels that has led Him to forgive all the pain I have inflicted on Him by my imperfection. And, in learning to forgive myself, I have learned to forgive others in humility, gratitude and deep caring for them, rather than just out of indifference. The Spirit is an even more intimate relationship in many ways. He hears the thoughts of my heart—both ugly and beautiful. He is the one who ties me together with my spiritual siblings. All my convictions rest in his incorporeal hands. I been trained as a horse is trained, with love and firmness, to rely increasingly on His guidance. His presence is like a cozy down comforter on a cold winter day. I am deeply grateful for His guidance. I am also grateful for the witness of Joseph Smith, who saw God the Father and Jesus Christ standing side by side. I am convinced in heart and mind that his account is honest and true. I'm glad for the surety and solidity of our doctrine on this matter. One in purpose, though separate in being, my LDS view of the Godhead is a model for how I should strive to unite with my fellow man. Like a family, each member fills its purpose to contribute to one great whole. May we, mortal children of God, and heirs to His glory, also achieve such unity. Together in God, our power is limitless. I Am a One, Why Does No One Come After Me? When I served a mission for my church, we had a few small pamphlets which we could stamp with our contact information and leave in the boxes or under the doors of those who were not at home. We often used them as sorts of business cards. I believe they were 5.5x8", folded in thirds. On the cover of the yellow version of this pamphlet was a question mark. It contained text asking if there were questions in the reader's life which they could not answer. Such questions included, "Who am I?" "Why am I here?" "What is the purpose of life?" There is a question which has come to the forefront of my mind many times in my life. In the parable of the ninety and nine, Christ tells of a shepherd who left his flock to search out the one which was lost. I feel that I am one who is lost, why does no one come after me? At many times in my life, I have felt cut off from the flock. Once, when I was fourteen, I was actively rejected from it. I have failed to really connect with a ward since returning to Utah after serving my mission. The feeling of failure and of being failed has at times become overwhelming. As a result of my estrangement, I have come to rely more and more on my Savior, knowing that He will never leave me comfortless. Once the tears are spent and I can calm enough to listen, He has always been there to comfort me. It took a change in my approach to realize that He has always been coming after me, just not in the ways I expected. I have often been tempted to stay home, or even at times to leave altogether. "There is no reason for me to attend Church," I think. "I can feel the Spirit more strongly by serving those who really need it, or by a quiet walk in the woods." Although I have felt the Spirit many times in such circumstances, I know that they cannot replace the need to struggle and fit into the body of the Church. In response to my desire to simply quit trying, the Spirit has also gradually whispered to my mind the understanding that I cannot allow my salvation to rest on others' shoulders. I cannot permit the actions and behavior of others to come between me and my God. The final thing I've been taught by my feelings of estrangement is a realization that I've been holding others to a standard I can't match. Not only am I not reaching out to others the way I wish they'd reach out to me, I am expecting other people to read my mind and somehow discern what I need. There is a reason God advises us to ask, knock and seek. I have not been asking others for help, I have not been seeking help. The Spirit can prompt others to help me, true, but if I am not willing to humble myself and ask, I cannot expect others to give to me. The Spirit will not often take up my slack. When I have been willing to open my heart, there have been special souls waiting to soothe it. It has built far stronger connections than I could have imagined, sometimes from unforeseeable quarters. There are many waiting to help, they only need to be shown how to do it. And, in the end, if you are truly alone on earth, you will never be without comfort if you are willing to accept it. D&C 61:36-37: "And now, verily I say unto you, and what I say unto one I say unto all, be of good cheer, little children; for I am in your midst, and I have not forsaken you; and inasmuch as you have humbled yourselves before me, the blessings of the kingdom are yours." I realize it was posted some time ago, but I just finished listening to a Mormon Matters podcast containing a Sunstone speech on the unsaid sermon. The unsaid sermon is essentially the cultural guilt we feel when hearing the positive spiritual experiences of others. An example would be if a member testified of the blessings they have received for not watching PG-13 movies, and a listener feeling that they are somehow less worthy for watching such movies. While it was interesting, and certainly explored a very real occurrence in Church congregations, and although it approached what I feel to be the most important aspect of this occurrence, I feel that the way it was discussed missed emphasizing a vital point. They continually mention the "false cultural doctrines" and "false notions" perpetrated by this sort of testifying. In fact, the very term "unsaid sermons" indicates that the person speaking is the one perpetrating these sorts of notions. They miss that the unsaid sermon is not a sermon from the speaker at all, but more accurately, a misinterpretation on the part of the listener. I believe this to be an important distinction because the connotation to their approach is that we should be more cautious and less free with stories of how the Lord has blessed our lives as a result of certain actions. Removing or even reducing these uplifting stories does not solve the root of the problem: a basic misunderstanding of God's ways and methods. While the speaker, Dr. Bohn, certainly focuses his points to remedy the situation on self-behavior, a thin thread of misleading information creeps its way into his phraseology. For example, his eighth point "Assume responsibility for our feelings and commitment to the gospel of Jesus Christ instead of reacting to other members’ well-meaning, false notions and cultural doctrines," begins focusing on your own behavior, but ends up shading blame on other members. Those "other members" are well-meaning, but full of false notions and cultural doctrines, according to him. This is harmful addendum to an otherwise good point. If I claim "I have made a personal covenant with God not to watch PG-13 movies, and this has blessed and purified my life. God has protected me from evil because of it," I am not testifying to either a false notion or a cultural doctrine. I am not trying to say that because I have ceased watching such movies and have been blessed, all members should do the same. In my life, I have made such a covenant and God has blessed me. I am testifying that the Spirit led me to make a covenant which has helped me personally. The take-away message focuses not on PG-13 movies, but on the act of covenant-making and/or letting the Spirit guide you to how you can purify your life. It also testifies that seeking to purify your life and acting on the Spirit's guidance will gain you blessings from God. The problem is not a false notion, but a false focus on the part of the listener. That listener is grabbing onto the thing in the testimony that will gain them more guilt, not trying to listen for the real message and see how it might apply to their own lives. They are throwing away their right to Spiritual guidance. Take the story of the stripling warriors in the Book of Mormon. One of their examples covers this exact tale. In it, 2000+ young men take up arms to defend their fathers who have taken a covenant to never kill another person. Because of the faith which was taught them by their mothers (and fathers), they are preserved. Although all are injured in the subsequent war, none are killed. This is used to show how a mother of a child killed in war might feel guilty. Perhaps she and her son were not as righteous. Perhaps she didn't teach him strong enough faith. What this thought misses is that there were many righteous Nephites who were killed in that story. Yet, this miracle was not only a blessing to the young men, but to the whole army. The take-away is not if you are righteous, you won't be killed. It is that the Lord is mindful of us, that faith will strengthen you, and that from time to time the Lord will bless our lives with miracles. Sometimes the Lord's blessing comes in the form of preservation, but in the perspective of an eternal, omniscient, loving God, sometimes it comes in the form of death. The key is to trust that God will protect His faithful when and how He can to bring to pass their immortality and eternal life. God's promise to deliver those young men was specific to them. Another faithful person has another calling. Neither life diminishes the other, but rather strengthens a true faith in God and His love, and knits those lives together into the body of Christ. The most powerful story that illustrates this concept is found in Daniel. Shadrach, Meshach and Abed-nego, Daniel's four friends, are pure and faithful, but face death in the furnace. In one of the most poetic and powerful statements of human history, they declaire, "O Nebuchadnezzar, we are not careful to answer thee in this matter. If it be so, our God whom we serve is able to deliver us from the burning fiery furnace, and he will deliver us out of thine hand, O king. But if not, be it known unto thee, O king, that we will not serve thy gods, nor worship the golden image which thou hast set up." Esther's story which peaks with the declaration "If I perish, I perish," shows no less vibrant, powerful faith. The key is in the faith, not in the miracle. If we water down our testimonies of God's hand in our lives in the interest of sparing other people self-manufactured guilt, we reject the chance to share our joy. I have often felt the power of unsaid sermons in my life, but I recognize that the problem is mine, not the speakers'. It is Satan whispering in my ear, focusing my attention on the details of the story rather than the moral. While Dr. Bohn has a good point, and good ways to focus on changing yourself and your attitudes, an important place to start is to cease thinking of others' experiences and personal perspectives as intrinsically wrong and realize that they are not wrong for sharing their life experiences and showing how God has blessed them. They are simply asking you to find joy with them. This is it: I am utterly disgusted with the entire presidential campaign. I expect some childish antics on the part of whichever nominees are elected. I expect it. Yet, they always amaze me with the depths of depravity they are willing to wallow in. Slinging muddy sandbox sand back and forth and crying loudly, "I'MRIGHTI'MRIGHTLISTENTOMEMOMMYI'MRIGHT," their so-called policies and sycophantic promises are deafened only by their immaturity. They are drowning in the things people want to hear and are not really looking outside the box. They are not really caring. I was under the impression from my U.S. History and Politics classes that you had to be 35 to run for president, but I'm beginning to doubt the accuracy of my information. It sickens me that my two-year-old daughter displays more maturity when I take her favorite cup away than either Obama or McCain show in their ostensibly adult politics. What makes it worse is that the American public can be compared to parents standing nearby, egging their children on. We are so enamored with drama, that we encourage it in our politicians. I am certain that if the American public (and especially the media) showed the least bit of maturity, the politicians would not throw it out the window along with their sense. It is embarrassing to the nth degree. I want to internationally hide my face in shame. Perhaps I shall start wearing a burkha so I won't be recognized. There is little to no chance that our "exalted country" would elect a reasonable, tough but kind person even should one run for office. I was joking about writing Mitt Romney in for president. It's not that I entirely agree with him, but that I could live with him in the White House, and I cannot stand either of the presidential candidates with one iota of tolerance. I think I'm going to change my write-in vote to my friend's cat, Mo, however. 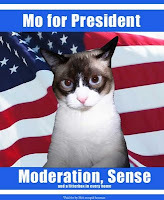 "Mo" is short for "Mo Evil Cat Genius" and I imagine he would do a better job of president than any human interested in the job. He has no chance of winning, as he reaches neither the age nor species requirement, but my vote for him would make my opinions of the presidential candidates perfectly clear (not that it would make a difference). His platform is "Moderation, Sense, and a Litterbox in Every Home." I prefer a candidate who is openly trying to take over the world and subvert the masses. On a note of complete seriousness and sobriety, however, I do believe that there is no way to morally vote in this election. I feel that if everyone took off their colored shirts, dropped their pet issues for just one moment and really looked at the sorry situation American politics is in, they would leave their shirts in the mud and depart far wiser people. The system is broken, folks. I know it sounds pessimistic, but I believe it is only a matter of time before the consequences show. We will pay for our choices. Of that, I have no doubt. This is an absolutely amazing discussion on political correctness and tolerance. I am intrigued and slightly jealous: I wish I had written it! Please read and comment there. "Brainwashed" is probably ranked with the weakest possible arguments. If I say you're brainwashed, I can ignore the chance that someone might be able to disagree with me and have a valid point. If I can relegate you to a pat little category, I don't have to listen. A little wake-up call, folks: it could be easily said that we are all brainwashed. We are all products of our environment. Quit name-calling and try—just try—to understand another person's point of view for once. You might find yourself stretching and growing. You might even find yourself becoming wise.